Canadian Ananya Chadha, winner of the CryptoChicks’ Toronto 2018 Hackathon with her genomic data on blockchain project — G-nome; has developed two cryptocurrencies and crowd-sale smart contracts with Ethereum ERC20 tokens. She is currently working on a brain controlled prosthetic arm, a brain-controlled drone, brain-controlled VR games with Microsoft and looking into intersections between blockchain and brain computer interfaces. Ananya is sixteen years old. Ananya is currently the youngest brain-computer interface developer in the entire world. According to Wikipedia, brain–computer interface (BCI), sometimes called a neural-control interface (NCI), mind-machine interface (MMI), direct neural interface (DNI), or brain–machine interface (BMI), is a direct communication pathway between an enhanced or wired brain and an external device. Ananya’s most recent BCI development uses brain waves to turn music on and off via thoughts and even drive a remote-control car using brain waves. While Ananya Chadha was working in genomics at the Toronto Hospital for Sick Children she had her eyes opened regarding where the medical industry was heading after speaking with a number of people in bioinformatics (combining biology, computer science, mathematics and statistics to analyze and interpret biological data) and machine learning developers (using statistical techniques to give computer systems the ability to “learn”). Ananya discovered that a significant portion of the world is transitioning into using artificial intelligence as a method of detecting mutations in DNA. To go one step further, once the mutations are discovered, diseases which cause the gene mutations can be cured. With great advancements comes new challenges as well. Our genetic data — our DNA — the data which defines who we are — is currently insecure. Privacy experts have warned consumers about using the various direct-to-consumer genetic testing kits due to privacy issues. Think of what large companies already know about us through our internet use, shopping habits, TV use, etc. Imagine how much more they would know about us if they had our DNA results? Your DNA says a lot about you beyond your European or African descent — it can tell you if you’re predisposed to like coffee. Also data-sets related to new drug developments are, quite often, skewered to developed, urbanized locations, which can lead to unintended — or even harmful — effects on those who fall outside the sample set. According to Ananya, the technology which currently relays gene sequencing data is extremely fragmented. Additionally, third-party “middlemen” so to speak, charge exorbitant fees to get genetic information to proper researchers. G-nome solves the problems associated with gene-editing through an accessible interface, as well as a secure upload and transmission of genomic data. G-nome provides privacy, while allowing users (you) to receive monetary compensation for contributions. Once the user receives their genomic data, that data can be uploaded to the G-nome site, then distributed across the InterPlanetary File System (IPFS), allowing the file to only be accessed through a specific hash code to those whom have proper permissions. The security is vastly increased through the IPFS system — security which becomes more secure as the project continues. When Ananya attended the CryptoChicks Hackathon — the first she ever participated in — she was originally on a team with five other women, working on a blockchain for taxes project for nonprofits. Finding the subject uninteresting, Ananya split with her team, deciding to focus on her genomics data on the blockchain platform — G-nome. Ananya credits her mentor, Kevin Zhang from Consensys, who made her realize that she should pursue something she is passionate about. According to Ananya, there were a number of challenges involved in the G-nome project, however believes her persistence paid off. 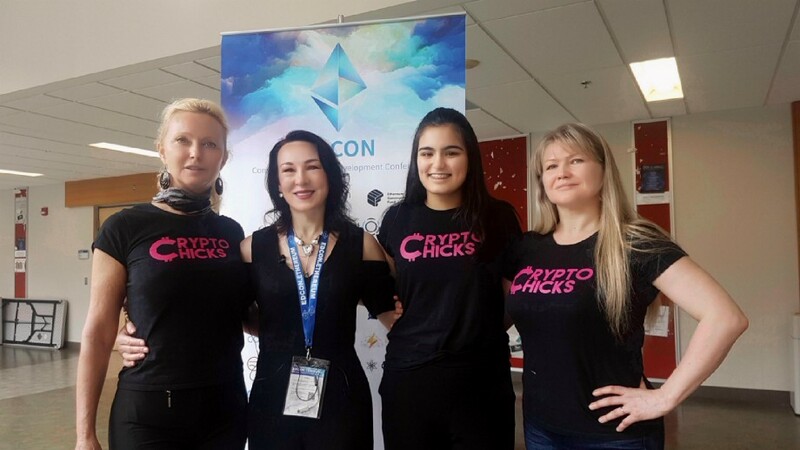 After the win at the Cryptochicks Hackathon, Ananya says there was a “domino effect.” She spoke at EDCON, the Community Ethereum Development Conference then spoke at the CDO Summit in New York. Ananya feels as though many opportunities have recently opened up for her plus she is planning to add more layers of encryption to the G-nome project, add an oraclize function and then get the project out in the world. Ananya, you don’t need to hope — you ARE building great things and are quite the inspiration for young Canadians, women and for all.